Protesting in the name of principles Hitler thought he had killed forever, Sophie Scholl and other members of the White Rose realized that the Germanization Hitler sought to enforce was cruel and inhuman, and that they could not be content to remain silent in its midst. CBI - China: Day 141 of 142 of the 1st Battle of Hebei. Germany: Nazis ban Jews from serving in the military, making proof of Aryan heritage a requirement for induction into the military. East Africa: As a reprisal for the failed assassination attempt of Italian Viceroy Rodolfo Graziani earlier this year, Italian troops massacre the entire community of Debre Libanos in Abyssinia, killing 320. Spain: Day 309 of 985 of the Spanish Civil War. Spain: Day 674 of 985 of the Spanish Civil War. CBI - China: Day 319 of 2,987 of the 2nd Sino-Japanese War. Day 104 of 124 of the Battle of Henan. CBI - China: Day 684 of 2,987 of the 2nd Sino-Japanese War. Day 32 of 35 of the Battle of Suizao. CBI - Mongolia: Day 11 of 129 of the Battle of Khalkhin Gol, a border dispute between the Soviet Union and Japan. ETO - UK: The British government announces that over 250,000 men have enrolled in the Local Defense Volunteers organization within the first 24 hours of its existence. ETO: The Luftwaffe bombs British ports in the English Channel while RAF bombers attack the refineries near Rotterdam, Netherlands. ETO - Norway: Day 43 of 63 of the Battle of Norway. The isolated German troops at Narvik are now close to exhaustion and won't be able to hold out for very much longer. ETO - Belgium: Day 12 of 19 of the Battle of Belgium. ETO - France: Day 12 of 44 of the Battle of France. The French 9th Army is surrounded and destroyed. The British attack against Rommel's tanks near Arras fails. CBI - China: Day 1,050 of 2,987 of the 2nd Sino-Japanese War. Day 189 of 381 of the Battle of South Guangxi. Day 21 of 49 of the Battle of Yichang. Atlantic: German sub U-69 violates US neutrality by sinking the unarmed American freighter ROBIN MOOR 800 miles off the coast of British West Africa. Later, U-69 strikes again, sinking the British ship TEWKESBURY. Atlantic: German sub U-93 sinks the Dutch tanker ELUSA off Greenland, while German sub U-98 sinks the British ship MARCONI. ETO - UK: Day 258 of 258 of the Blitz. Hitler now has his sights set on Operation BARBAROSSA, the invasion of the Soviet Union in June. His failed Blitz un-ceremonially comes to end. ETO - UK: The Women's Land Army in the United Kingdom now has over 11,000 members. ETO - France: In absentia, a Vichy French military court sentences 56 enlisted soldiers who sided with de Gaulle to death or hard labor and declares all their property to be confiscated. USSR: Soviet intelligence tells Stalin that an attack on the USSR is imminent. However, Stalin refuses to believe it, claiming the evidence is false information planted by the British. Because General Proskurov argues with Stalin, SO he is arrested and shot. MTO - Greece: Day 2 of 13 of the Battle of Crete. More German paratroopers arrive at Maleme in JU-88s, landing at the base. The British Royal Navy sinks 11 small Axis vessels near the island of Milos. Italian bombers sink the destroyer HMS JUNO while the Luftwaffe damages the HMS AJAX, HMS DIDO and HMS ORION. MTO - Libya: Day 42 of 256 of the Siege of Tobruk. Middle East: Day 20 of 30 of the Anglo-Iraqi War in Iraq. East Africa: Day 346 of 537 of Italy's East African campaign in the lands south of Egypt. CBI - China: Day 1,415 of 2,987 of the 2nd Sino-Japanese War. Day 15 of 21 of the Battle of South Shanxi. Chinese fighters intercept a group of Japanese bombers over Lanzhou shooting down one and damaging others. Mexico: After the sinking of three Mexican tankers by German U-boats, Mexico declares war against the Axis powers. Some 300,000 Mexican citizens will go to the US to work in factories that produce war supplies and to help in any way that will benefit the Allies. Around 15,000 US nationals of Mexican origin and Mexican residents in the US will enroll in the US Armed Forces and fight in various fronts around the world. 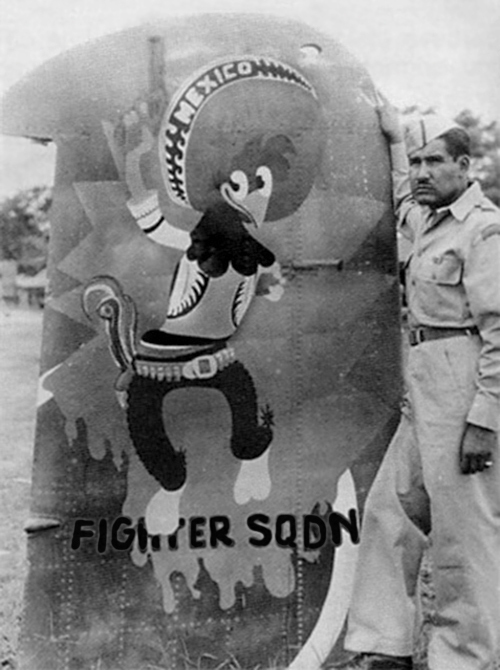 Clark Field, Philippines, 1945: Sgt Manuel Alcantar poses with the squadron mascot, Pancho Pistolas, taken from the Disney "Three Caballeros" character Panchito and painted here on the tail of a downed Japanese fighter. The country of Mexico formed Escuadrón 201, a Mexican fighter squadron, part of the Fuerza Aérea Expedicionaria Mexicana (Mexican Expeditionary Air Force). The squadron flew 96 combat missions in the Philippines in the summer of 1945, the only Mexican unit to see overseas combat in their nation's history. Atlantic: Day 128 of 169 of Germany's Second "Happy Time," during which U-boats sink 609 Allied ships with little risk. U-588 sinks the US freighter PLOW CITY east of New Jersey. Russian Front - North: Day 256 of 872 of the Siege of Leningrad. Russian Front - North: Day 17 of 658 of the Siege of the Kholm Pocket. Russian Front - South: Day 10 of 17 of the 2nd Battle of Kharkov, Ukraine. The Soviets are being surrounded, so a retreat is ordered. Russian Front - South: Day 204 of 248 of the Siege of Sevastopol, Crimean Peninsula. MTO - Malta: Hitler indefinitely postpones the invasion of Malta. East Africa: Day 17 of 186 of the Battle of Madagascar. CBI - Burma: Day 159 of 164 of Japan's Invasion of Burma. CBI - China: Day 1,780 of 2,987 of the 2nd Sino-Japanese War. Day 7 of 124 of Japan's Zhejiang-Jiangxi Campaign, launched to punish anyone suspected of aiding the Doolittle raiders in China. Roughly 250,000 Chinese will be killed. PTO - Japan: Japan allows International Red Cross representatives to visit British prisoners. PTO - Malaya: Day 92 of 357 of the Battle of Timor Island. US 5th Air Force B-17s attack the airfield and AA guns at Koepang Bay. PTO - New Guinea: US 13th Air Force B-26s bomb the airfields at Lae. USA: News of the 18 Apr 43 killing of Admiral Yamamoto raises morale across the country. To protect the fact that Japan's codes had been cracked, news agencies report that civilian coastwatchers in the Solomons had observed Yamamoto boarding a bomber and relayed the information by radio to American naval forces in the immediate area. ETO - Germany: US 8th Air Force B-17s bomb the U-boat yards at Wilhelmshaven and Emden. Russian Front - North: Day 621 of 872 of the Siege of Leningrad. Russian Front - North: Day 382 of 658 of the Siege of the Kholm Pocket. MTO - Malta: Luftwaffe FW-190s bomb at Malta. MTO - Monaco: The Royal Navy submarine HMS SICKLE torpedoes the world famous Monte Carlo Casino. While attacking shipping in the harbor, one of the torpedoes runs up the beach and explodes, blowing out the windows. MTO - Italy: US 9th Air Force RAF Liberators night bomb Messina and Reggio di Calabria. During the day, B-24s hit Vila San Giovanni and Reggio di Calabria. MTO - Italy: US 12th Air Force RAF Wellingtons night bomb the airfields at Villacidro and Decimomannu in Sardinia. During the day, US planes bomb the same airfields again. CBI - China: Day 2,145 of 2,987 of the 2nd Sino-Japanese War. Day 10 of 23 of the Battle of West Hubei. PTO - Alaska: Day 349 of 435 of the Battle of Kiska, Aleutian Islands. Day 11 of 20 of the Battle of Attu. US 11th Air Force provides air support. PTO - Japan: One month after the death of Isoroku Yamamoto, the news is finally revealed to the Japanese public. PTO - New Guinea: Day 30 of 148 of the 2nd Battle of Lae-Salamaua. US 5th and 13th Air Forces provide air support. ETO - France: US 9th Air Force B-26s bomb airfields at Abbeville/Drucat. Germany: Adolf Hitler gives the order that all downed Allied airmen are to be shot without trial. Russian Front - North: Day 110 of 191 of the Battle of the Narva Isthmus, Estonia. Both German and Soviet troops remain in their defensive positions. Russian Front - South: Day 44 of 60 of the Battle of Romania, 1st Jassy Offensive. MTO - Italy: The Polish troops take Monte Cassino after a very hard fight. MTO - Italy: Day 121 of 136 of the Battle of Anzio. RAF and US Air Forces provide air support. CBI - Burma: Day 78 of 166 of the UK's Operation THURSDAY. CBI - Burma: Day 73 of 147 of the Battle of Myitkyina. US 10th Air Force provides air support. CBI - Burma: Day 51 of 302 of the Chinese Salween Offensive. US 14th Air Force provides air support. CBI - China: Day 2,511 of 2,987 of the 2nd Sino-Japanese War. Day 35 of 259 of Japan's Operation ICHI-GO. Day 35 of 39 of the Battle of Central Henan, the first offensive in Japan's Operation ICHI-GO. CBI - India: Day 75 of 118 of the Battle of Imphal-Kohima. Anglo-Indian troops capture Kanglatongbi. PTO - Hawaii: An accidental explosion on board a US LST (Landing Ship, Tank) while unloading ammunition at Pearl Harbor ends up sinking six LSTs, killing 121 and injuring 380. PTO - Marshall Islands: The US 7th Air Force bombs targets in the Wotje Atoll. PTO - New Guinea: Day 159 of 597 of the Battle of New Britain. US 13th Air Force provides air support. PTO - New Guinea: Day 30 of 481 of the Battle of Western New Guinea. PTO - Solomon Islands: Day 203 of 295 of the Battle of the Bougainville Islands. US 13th Air Force provides air support. Germany: Heinrich Himmler is arrested by British troops near Bremen. He had disguised himself as a refugee named Heinrich Hitzinger and was trying to flee with the masses. CBI - China: Day 2,876 of 2,987 of the 2nd Sino-Japanese War. Day 51 of 91 of the Battle of Zhijiang. US 14th Air Force provides air support. Japanese troops begin pulling out of China. Day 43 of 60 of the Battle of West Hunan (near Zhijiang). Japanese troops continue withdrawing from southern China. PTO - Dutch East Indies: Day 21 of 52 of the Battle of Tarakan Island. PTO - Japan: US 7th Air Force conducts night attacks on Kyushu Island. PTO - Japan: Day 51 of 83 of the Battle of Okinawa. The Japanese begin evacuating Shuri. PTO - New Guinea: Day 511 of 597 of the Battle of New Britain. US 10th Air Force provides air support. PTO - New Guinea: Day 395 of 481 of the Battle of Western New Guinea. US 10th Air Force provides air support. PTO - Philippines: Day 213 of 299 of the 2nd Battle of the Philippines, aka the Liberation of the Philippines or the Philippines Campaign. PTO - Philippines: Day 158 of 244 of the Battle of Luzon. 5th Air Force provides air support. PTO - Philippines: Day 73 of 159 of the Battle of Mindanao Island. 5th Air Force provides air support. PTO - Philippines: Day 65 of 135 of the Battle of the Visayas region. US 5th and 7th Air Forces provide air support.